JOURNAL|NOVEL|MUSIC|3D|PHOTO|VIDEO|DISNEYLAND|KNOTT'S|HOME|WinR|WIZARD|CONTACT <8=o)—Disneywizard's Flickr 3D Photos—(o=8> "Where in Disneyland?" Enjoy the videos, pay the piper. That's right! Your deductible donation to the performing arts goes straight into the hat, and one hundred percent of administration fees are not enough to keep the magic alive. If you have ever giggled silly from too much fun or taken an idea to heart then now is the season to put something back. If you have enjoyed the show or merely walked by, even if you didn't have a penny in your pocket at the time, please pledge your support of starving artists now. The magic can only be kept alive by donations from viewers like you. <8=o0— Quiz, for extra credit, answer below: "What do you call a dead cow?" Question: What do you call a cow with four legs? Q: What do you call a cow with one leg? Q: What do you call a cow with no legs whatsoever? Hello! I'm Maggie! I'm a cow. Well, actually a Holstein heifer - no bull. I have a question. What ever happened to Mickey Moo? Frederica: "Explain again to me why we are down in this trench?" Edwina: "Because we all have hoof in mouth disease." Frederica: "What's hoof in mouth disease?" Edwina: "You see that foam hanging off of our lips?" Edwina: "Well, they're going to bury us in dirt after shooting us in the head unless you can wipe that foam off your mouth." serving them to overweight wieners that have outgrown their bun wrappers, for chips. 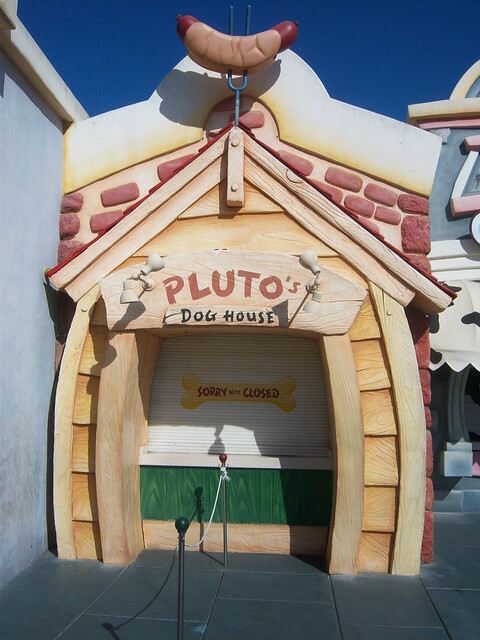 That feed-pen is called "Pluto's Dog House." Well, cows don't live forever, even if they are pardoned by George W. Bush. Maggie Mocks Meat!, with Mickey Moo Mouth. 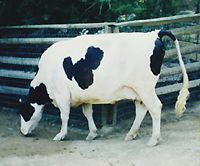 So I went to visit Maggie, and gently explain what became of her pen's predecessor, Mickey Moo, a Holstein (shown above) cow that had a "Hidden Mickey" shaped spot on her left side. She's kicked the bucket, so to speak. She's at Pluto's Dog House, tongue 'n cheek." Q: "What do you call a dead cow?" A: "Beef." If you answered "The Dinner Bell", "Lunch", about to rot, hamburger, poor milk provider, stroganoff helper, or any other reference to meals off heels, then you WIN! If you had in mind some sort of burial, you loose. Whip up some Bar-B-Que sauce and light the funeral pyre! Holler the help to the hollow, we're hostin' a hoedown!